An old fashioned and very popular variety Camellia Japonica Grand Marshall has attractive red flowers and good glossy green foliage. Like many C. japonica types is is a little slow in growth rate over the first 2 – 3 years. Once the plant is established the growth rate improves. Upright in habit it makes a good screening pastas well as feature plant. Choose a position where the soil is good, and free draining. Full morning sun to filtered afternoon light in cooler climates more shade in warmer areas is best. Prepare the soil well before planting. Dig over and add some well rotted compost and a little aged cow manure. Make sure you dig the area over to twice the width of the container as this will encourage good root growth. Firm in and water in with a liquid seaweed fertiliser. Remove any dead wood as it appears. Prune to shape and size as required affect flowering. Grand Marshall takes well to pruning. Position – Part shade to filtered light. Soil – Best suited to a slightly acidic humus rich moist soil.. Spread – Forms a clump to around 2 metres. Growth rate – Slow at first then medium. 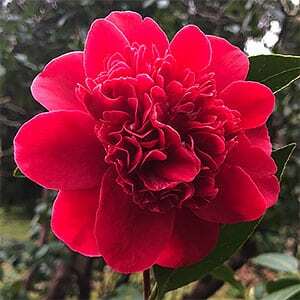 Flowers – Deep red informal peony type blooms. Foliage – Good glossy green.